It’s not difficult to be a basketball fan. All you need to do is sit down and watch a game with your mind opened to the possibility of witnessing displays of aerial supremacy and otherworldly athleticism impressive enough to provoke an episode of schizophrenia in unsuspecting people. Being a basketball nerd though, chasing these displays, actively trying to find beauty in every well-executed aspect of the game and finding the working class heroes of the game, now therein lies the challenge. Since I’m a good guy, I’m going to help you with this guide to the most enjoyable players of the 2015 NBA playoffs. Only a couple rules: 1) None of these players can be LeBron James 2) None of these players actually are LeBron James 3) None of these players have been nominated on this years’ all-star team (so there’s no obvious answers) 4) Players that’ve been part of the rising stars challenge or the skill contests are eligible and 5) Only one player per team. So, let me introduce you to your favorite NBA players you don’t already know. 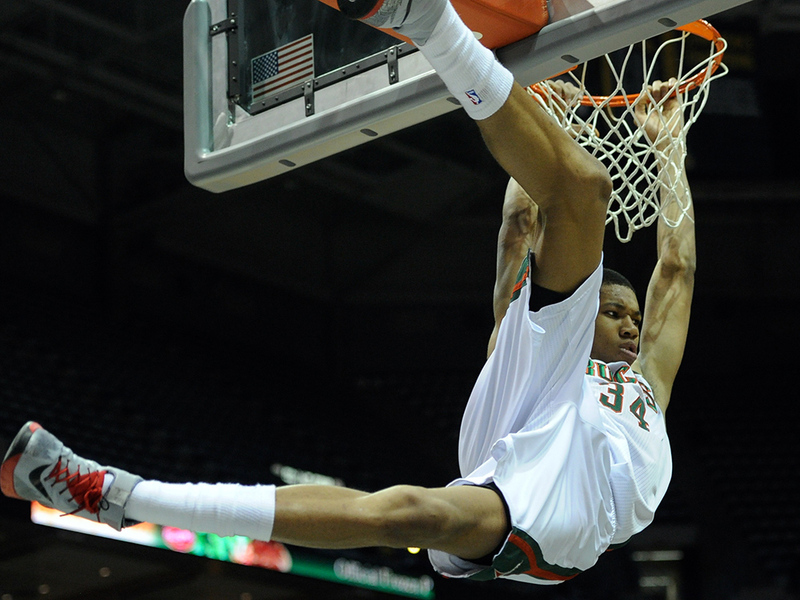 Giannis Antetokoumnpo (SF) – Milwaukee Bucks: I have written this name so many times right now, I can spell it out loud. He is nicknamed the Greek Freak, not because he scores a freaky amount of buckets (averages 12.7 pts a game), but because he has ridiculous, rubbery arms and he does freaky, impossible stuff with his body like dunking a sky hook, eurostepping from the 3 points line (conveniently renamed gyro stepping) and going Michael Jordan on unsuspecting defenses. Plus he loves pancakes. Who doesn’t like a 20 year old mutant who loves pancakes? Giannis is basically a real life teenage mutant ninja turtle, except for the turtle part. Boris Diaw (PF) – San Antonio Spurs: It’s possible you don’t know Boris, because he’s a career rotation guy. If you don’t though, you’re missing you. Once billed a problem player and an enigma on other teams, the frenchman found himself under legendary coach Gregg Popovich who exploited Boris’ creativity in his motion offense. Diaw is a big (sometimes out of shape) power forward with the finesse game of a guard and a vision from the post few players have. Whatever comes out of him is always graceful, quirky and soooo sloooowww. Diaw exploits the lack of refinement of most bigs on the low blocks like only a sophisticated euro would. He’s the basketball alternative to the dude. He’s the perfect man for his time and place. Nikola Mirotic (PF) – Chicago Bulls: There’s a harsh beauty to observing white guys play basketball, like watching a the world bend and thwirl during a tropical storm. Everything seems painful and heroic. Little things are more tragic than watching Jimmer Fredette trying to play NBA basketball. Nikola Mirotic is some kind of superhuman exception to that rule. He’s not a freak athlete by any means, but he’s got NBA size for his position and he is a player of a rare finesse. Mirotic played in the Euroleague for 3 years before making it to the NBA and several urban legends were running about him and everything turned out to be true. He can shoot three better than most bigs, he has a soft touch around the rim, can finish over his defender, plays good team defense, frequently outsmarts his man. He hasn’t made the all-star team because of the logjam in Chicago’s frontcourt, but it’s going to happen sooner than later. He’s also nicknamed ThreeKola, which is an endorsement waiting to happen. Draymond Greeen (PF) – Golden State Warriors: Consider this chapter 97 of my “Draymond Green is awesome” best-selling book (coming to you in 2015-16). Draymond Green is awesome for plenty of reasons that don’t involve his stat line. I mainly watch him because he’s an absolute pest, backing the opposing team’s star fowards to the perimeter, forcing them to take low percentage shots. Green plays basketball with purpose and intensity, and there is an inexplicable, life-affirming pleasure to see him gobble a rebound and wave his elbows like a man possessed he’s redefining the importance of what it is to be a role player and his habit of doing the little things will make him increasingly more relevant in this era of team basketball. Draymond Green is the ultimate glue guy. It’s because he does what he does that you’re able to admire Steph Curry and Klay Thompson burning down the house, every night. K.J McDaniels (SG) – Houston Rockets: If you’re quiet enough and if you watch the Houston Rockets Vs Dallas Mavericks series long enough, you might see a wild K.J McDaniels appear. Daryl Morey acquired the rookie for a song at the trade deadline and since them has him buried in the rotation, but he’s not tricking the nerds. We still remember the displays of insane athleticism on defense. We also remember his uncanny ability to finish at the rim. You’re not fooling anybody, Morey. We want McDaniels on the court. We want to see the guy Bill Simmons compared to Scottie Pippen after forgetting to take his meds. Stay tuned, part two will be published this weekend. In the meantime, you’ve got some games to watch and new players to follow!